The new edition of Cartographies of Disease: Maps, Mapping, and Medicine from Esri traces the long history of how maps have been used to help unlock the mysteries behind the cause and spread of diseases such as cholera, yellow fever, and Ebola. When first published in 2005, Cartographies of Disease showed how maps could be an important tool for studying both chronic conditions and disease epidemics. It became a must read for policy makers and others working in public health and medicine. In this expanded edition, author Dr. Tom Koch adds new material to deepen readers' understanding of medical mapping from the seventeenth into the twenty-first centuries. 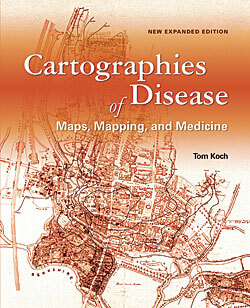 The book covers the mapping of diseases and medical conditions. "Cartographies of Disease is a book about our confrontations with bacterial and viral agents across history," Koch wrote in the book's introduction. "It is also about how maps help us profile those conditions in our attempts to restrict them. Ebola in 2014 reminded us that it's urgent to understand the conditions that promote disease and the ways we confront them on the ground." The book provides a nontechnical narrative and a visual history of mapping's role in studying diseases: their causes, where and how they spread, and how they can be combated. In this new edition, Ebola is the focus of the two new chapters. Perceptions of the disease and reactions to it are mapped using contemporary technologies such as GIS. It includes more than 100 maps and charts, from a pair of 1694 maps of plague locations and containment zones in Bari, Italy, to digital maps of the 2014 Ebola outbreak, created using GIS. Koch is a medical ethicist, gerontologist, and prolific author who is based in Canada. As an adjunct professor at the University of British Columbia, Vancouver, he developed a series of teaching labs for medical geography. He authored "Visualizing Disease: Understanding epidemics through maps," which ran in the spring 2011 issue of ArcUser. Esri Press, 2017, 412 pp., ISBN: 9781589484672.